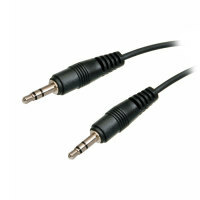 The perfect solution for connecting your portable music player to your car's AUX IN socket. To connect portable devices such as MP3 players (e.g. for iRiver, iPod...) to a radio/amplifier with 3.5mm socket (Line In). Perfect solution for connecting your portable music player to your car's AUX IN socket. Length of cable is approximately 1m.